A blind, formally called a blind bet, is a forced bet that is made blind, meaning that the player makes the bet even before seeing their cards. Blinds, like antes, are used to stimulate play, and they avoid many no-action rounds. Unlike antes, not all players pay the blind each hand. Instead, there is a big blind, the player to the left of the dealer or dealer button, and the small blind, which is the player to the left of the big blind and two to the left of the dealer or dealer button. It's worth noting that some games uses an ante in conjunction with the blinds, and some games use only one blind, and other games use three or more. But the two-blind no-ante structure is by far the most common. If only two players remain in a game that uses the two-blind structure, then the player-dealer or the player with the button is always the small blind. 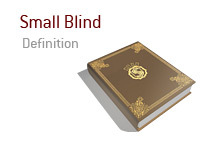 A small blind can knock a player out of the game if the small blind is equal to or larger than the player's stack.